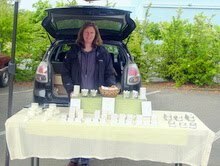 Handcrafted organic soaps from scratch with wonderful scents such lemon grass ginger. The Wednesday market is a great time to talk to the vendors. Larry at Triple T can help your garden grow. Not too mention Triple T has a great selection of Spring greens. Organic veggie starts and greens. 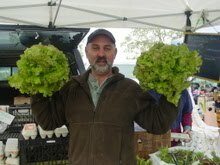 Tom Noble of Armstrong Valley Farm shows off some beautiful lettuce. The one time you should eat something bigger than your head. The big news at the Santa Rosa Original Certified Farmers Market this spring is that there are enough eggs to satisfy demand. By my count, there are six vendors Saturday and at least three Wednesday. As recently as last year, you had to arrive at the market a few minutes before official opening time or risk missing out. Once you’ve eaten eggs from happy hens who live in small flocks, it is impossible to return to commercial eggs. For everyone who relies on the farmers market for eggs, this is great news and just in time for Easter, too. There’s another good reason to show up early: asparagus. Even with several vendors — Middleton Farms, Triple T Farm, Hector Alvarez, Armstrong Valley Farm — it can be hard to find if you arrive late. And nothing compares to locally grown, freshly picked asparagus; it has a crispness and a delicacy that commercial asparagus does not have. Another reason to rise early is to snag some of Bernier Farms’ carrots. Because so many farmers lost crops during the recent heavy rains, there are not a lot of local carrots right now, though Armstrong Valley Farms may have a few bunches. Farmer Tom Noble told me he hoped some would be ready soon. Other seasonal delicacies available at the Santa Rosa market include nettles, leeks, shallots, rhubarb, Jerusalem artichokes and the first green garlic, as thin as a pencil, all from Nancy Skall’s Middleton Farm. Ken Orchard of Orchard Farms has wonderful sprouting broccoli, a mix of flowering broccoli and small dinosaur kale, salad mix and broccoli rabe. Both Hector Alvarez and Nancy Skall have garlic that has been stored properly and will get you through until this year’s crop is ready. Ortiz Brothers Farm has great greens, including flavorful cilantro, crunchy radishes and excellent cabbage. There’s a good selection of mushrooms, too, and there is still plenty of good citrus, including locally grown grapefruit, Meyer lemons, oranges and tangerines. Santa Rosa’s Saturday market is about three or four times the size of the Wednesday market. Some vendors attend both weekly markets; others attend only Saturday and some just once or twice a month. 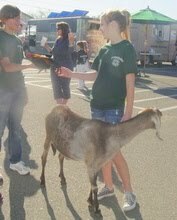 The Market officially celebrates Earth day on Saturday April 23rd with special guests The Forestville 4H Club and their baby animals. This weekend the market welcomes Terra Firma Farm from Petaluma and they are bringing baby chicks. 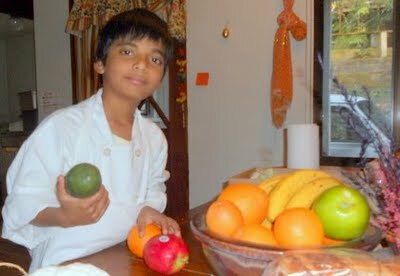 Wednesday April 27th 11 AM Lata will give a demonstration of vegetarian Indian cooking. This year Lata returned to India to refresh her cooking skills and learn more about aryuvedic recipes and cooking. 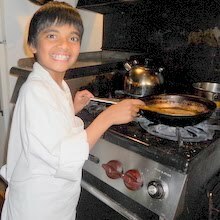 The photos are of Lata’s two sons who enjoy cooking with her. Bring your kids to the demonstration too. 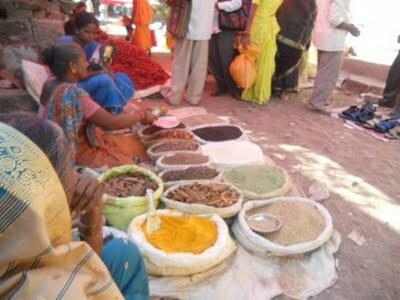 The other photos are of an Indian spice market and Lata. 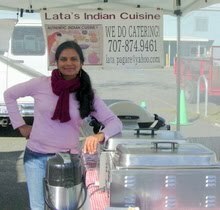 Sonoma County Loves Lata’s Indian Cuisine.